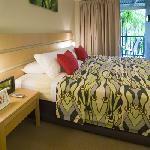 Rydges Sabaya Resort Port Douglas the perfect base to experience Tropical North Queensland. Nestled by the Rainforest - Moments to the Ocean - Minutes to the Reef ! The Rydges Sabaya Resort is ideally located just minutes from the relaxed seaside village of Port Douglas, and the famous Four Mile Beach. Port Douglas is approximately one hours drive north of the Cairns International and Domestic Airport, via a spectacular coastal road that is bounded by lush tropical rainforest and the glistening Coral Sea. Set in lush tropical gardens, Rydges Sabaya Resort Port Douglas is an ideal base from which to experience the World Heritage Rainforests, the majestic Daintree River, the creeks of Mossman Gorge, the palm fringed golden sands of the local beaches and the underwater world of the Great Barrier Reef. World-class golf, game fishing, diving, sailing, snorkelling and nature walks are all a way of life here. A short distance away, the village atmosphere of Port Douglas awaits. A variety of restaurants, bars and shops are available for all tastes and budgets. Port Douglas offers some of the best dining experiences in North Queensland with a focus on local produce and style. A regular shuttle service operates daily from the resort to the village, at a nominal charge. This brand new, luxury Port Douglas Resort offers 192 spacious hotel resort rooms and apartments, ideal for business or leisure travel. Each apartment features open plan designs, individually controlled air-conditioning, modern bathroom with large walk-in shower and vanity, flat screen televisions – wall mounted, writing desk, high speed internet access, telephone with IDD dialling, mini bar, tea and coffee making facilities, quality finishes and private balconies/patios with views of the lagoon pool or the lush landscaped tropical gardens. Relax in the comfort of your room, take in the resort activities or bask in the spectacular lagoon pool while sipping a cocktail at the Biru swim-up pool bar. Simply indulge yourself in the day spa, unwind in the Lotus Lounge, dine at the Sakinah House Restaurant or take advantage of the myriad of surrounding attractions. It's your choice! Rydges Sabaya Resort Port Douglas is the perfect base to experience tropical Queensland. * Port Douglas Village hub, 4 minutes drive. Regular shuttle bus service is available every 15 minutes, nominal charges apply. * Port Douglas Markets, open on Sundays 8am to 2pm. * Great Barrier Reef diving and snorkelling trips, tours pick-up and drop-off from resort. * Marina Mirage, drive time is approx 5 minutes to the Wharf. * Four Mile Beach, 20 minutes leisurely walk. * Hartley's Crocodile Park, enjoy enroute from Cairns. Drive time 15 minutes between resort to Farm. * Kuranda Village, Scenic Railway and Skyrail, best covered on the way to Cairns, approx drive time from resort 40 minutes. * Daintree National Park, drive time is approximate 60 tropical minutes. * Cape Tribulation, 2 1/2 hours drive time including ferry. * Famous Mossman Gorge! Drive time is only 10 minutes. * The Rainforest Habitat, 5 minutes drive time. Breakfast with the Birds! Complimentary car parking is available for resort guests. Overlooking the Resort's landscaped gardens, the One Bedroom apartment features a spacious bedroom with flat screen wall mounted television and either one King Bed or two Single Beds (please specify preference when booking), modern kitchenette facilities inc. mini fridge, convection microwave, toaster, 2 hotplates, modern bathroom with double vanity, walk-in shower, private balcony/patio off lounge and bedroom, separate air conditioning units in lounge and bedroom and a separate living/dining room with a double sofa bed, large flat screen television in lounge, DVD/CD player, writing desk, high speed internet access, telephone with IDD dialling, mini bar, iron/ironing board and hairdryer. Weekly Service. Rate is for max 2 adults & 1 child. Maximum 4 guests. Extra guest charge $42.00 per guest per night. These recently renovated stunning apartments offer two spacious bedrooms each with flat screen wall mounted television and 1 King Bed or 2 Single Beds (please specify preference when booking), modern kitchenette facilities inc. mini fridge, convection microwave, toaster, 2 hotplates, TWO BATHROOMS, private balcony/patio off lounge and master bedroom, separate air conditioning units in lounge and bedroom as well as a separate living/dining room with a double sofa bed, large flat screen television in lounge, DVD/CD player, writing desk, high speed internet access, telephone with IDD dialling, mini bar, iron/ironing board and hairdryer. Weekly Service. Rate is for max 2 adults & 2 children. Maximum 5 guests. Extra guest charge $42.00 per guest per night. Overlooking the Resort's landscaped gardens, this hotel style room features new modern furnishings and fittings. The spacious room comprises one King Bed or two Single Beds (please specify preference when booking), modern bathroom with large walk-in shower and vanity, private balcony/patio, individually controlled air conditioning, flat screen televisions – wall mounted, writing desk, high speed internet access, telephone with IDD dialling, mini bar, tea and coffee making facilities, iron/ironing board and hairdryer. Rate is for 2 guests. Maximum 2 guests. Daily Service. Overlooking the Resort's lagoon pool, this hotel style room features new modern furnishings and fittings. The spacious room comprises one King Bed or two Single Beds (please specify preference when booking), modern bathroom with large walk-in shower and vanity, private balcony/patio, individually controlled air conditioning, flat screen televisions – wall mounted, writing desk, high speed internet access, telephone with IDD dialling, mini bar, tea and coffee making facilities, iron/ironing board and hairdryer. Rate is for 2 guests. Maximum 2 guests. Daily Service.